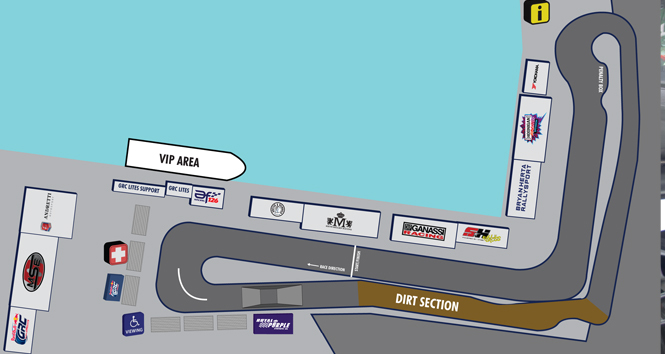 The Red Bull Global Rallycross Championship kicks off this weekend on the streets of Ft. Lauderdale, Florida. We’ve been excited about the new 2015 season for a couple of reasons. For one, the finale last year was simply epic with the young Finn Joni Wiman (pronounced “yon-ee” “Vee-man”) of Olsbergs MSE coming out as the champion narrowly beating out chief Hoonigan Ken Block. The other reason is that the series showed remarkable improvement as the season went on with ever improving track designs and better racing between drivers. If this season is anything like the second half of last season, you’ll definitely want to tune in. Although the track in Ft. Lauderdale is fairly short at only 0.42 miles, they smartly placed the joker in the first turn which allows the groups of cars to split up preventing massive T1 incidents. Although not terribly interesting by design, this track does have long enough straights to offer passing opportunities, it just lacks the amount of dirt I think most of us like seeing. That said, I think this weekend’s race is going to have some great battles. Ken Block is known for typically topping the qualifying and heat races, but competition this year is likely to be quite stiff. Andretti Autosport’s Tanner Foust and Scott Speed will be hot on his heels in their Super Beetles, as will be last year’s champion from Olsbergs MSE, Joni Wiman. Nelson Piquet Jr. got off to a great start last season, will that happen again? The big unknowns for this weekend is how much an improvement we’ll see from Steve Arpin and Brian Deegan under the new Chip Ganassi Rallycross team banner. And Subaru Rally Team USA is debuting their new 2015 WRX STI GRC car. Will the new car be more competitive than last year’s model which already has a win under its belt? Don’t forget to follow the GRC Lites as well. Tim Cindric’s son Austin Cindric is now driving under the OMSE banner and is a proven talent, but he’ll be facing a big challenge from teammate Oliver Eriksson who’s been competing in Europe as well as the Red Bull GRC Lites. There is also the bevy of young Mazda Road to Indy talent in the GRC Lites that could shake up the field. IN BRIEF: The 2015 Red Bull Global Rallycross season kicks off with a brand new event in Fort Lauderdale at the Bahia Mar Resort. Scott Speed will look to win his third straight season opener, while Joni Wiman will hope to kick off his championship defense on a high note over such competitors as Ken Block, Tanner Foust, Nelson Piquet Jr., and Bucky Lasek. NBC Sports Group will be offering live streaming of the Global Rallycross Fort Lauderdale race through the NBC Sports Live Extra app via desktop, mobile and tablet. LAST RACE: Ken Block won the battle, but Joni Wiman won the war in Red Bull GRC’s 2014 season finale in Las Vegas. Block dominated the weekend to win his second race of the season, but Wiman, despite going winless all year long, earned just enough points with his runner-up finish to steal the championship. DRIVER CHANGES: Click here for a 2014-15 silly season recap detailing driver changes since last year’s finale in Las Vegas. THE TRACK: Click here for full details about the brand new .420-mile course at the Bahia Mar Resort. SEASON OPENER TO TAKE PLACE IN FORT LAUDERDALE FOR FIRST TIME: Fort Lauderdale will host its first Red Bull Global Rallycross event this weekend, the second Florida-based event in the series’ history after a debut run at Daytona International Speedway last year. The event will kick off a busy month to start the 2015 season, with the non-points event at X Games Austin following next weekend and a return to Daytona in three weeks’ time. NEW VEHICLES PROLIFERATE SUPERCAR GRID: After the 2014 season, many of Red Bull GRC’s top drivers swapped out their old rides for fresh machinery, whether or not they changed race teams in the offseason. Subaru Rally Team USA has replaced Bucky Lasek and Sverre Isachsen’s hatchback WRX STIs for the newer model sedan, while Steve Arpin, Brian Deegan, Austin Dyne, and Patrik Sandell will all join Ken Block in M-Sport Ford Fiesta STs. While the Volkswagen Andretti Rallycross squad retains Beetles for Scott Speed and Tanner Foust, this year’s cars have swapped out the 1.6-liter engines for 2.0-liter powerplants. ERIKSSON, GONZALEZ JOIN SUPERCAR GRID: Sebastian Eriksson of Olsbergs MSE and Victor Gonzalez Jr. of Rhys Millen Racing are the two newcomers on the 2015 Red Bull GRC Supercar grid. Eriksson, the 2013 GRC Lites runner-up, spent last year racing Supercars in Europe and coaching Lites drivers worldwide. Gonzalez, the first Puerto Rican driver to ever compete in NASCAR, will be making his rallycross debut in the event. IN BRIEF: GRC Lites’ third season kicks off with a new event in the city of Fort Lauderdale this weekend. With a record-tying ten entries, including six newcomers to the class, Lites is poised for its finest season yet. LAST RACE: Mitchell DeJong set a record with his seventh win of the 2014 GRC Lites season in last year’s finale in Las Vegas. Andreas Bakkerud, making his GRC Lites debut, finished second, while Austin Cindric placed third. In addition to the changes here, Duncker Felix Jr. will substitute for Alex Keyes in this weekend’s event, while Miles Maroney will join Felix as a teammate at Dreyer & Reinbold Racing. LITES CLASS BOASTS RECORD-TYING FIELD: Ten drivers will compete in this weekend’s GRC Lites event in Fort Lauderdale, tying last year’s record at X Games Austin. Only four of this weekend’s drivers—Olsbergs MSE teammates Austin Cindric and Oliver Eriksson, AF Racing’s Alejandro Fernandez, and DTV Solutions’ Geoff Sykes—have competed in a GRC Lites event before. STANDALONE TV PACKAGE FOR LITES IN 2015: For the very first time, GRC Lites will have its own race broadcasts in the 2015 season, airing in the week following the event on the NBC Sports Network. The first Lites broadcast will air on NBCSN on Wednesday, June 3 at 4:30PM ET. Leigh Diffey and Anders Krohn will call the event. NEW TEAMS ENTER GRC LITES: DirtFish Motorsports, River Racing, and Dreyer & Reinbold Racing will all make their first GRC Lites appearances in this weekend’s event. Dreyer & Reinbold, which will enter two vehicles, has competed in IndyCar events since 2000, while DirtFish Rally School has served as a previous Red Bull GRC event host and vehicle sponsor. River Racing, which will run in cooperation with Bryan Herta Rallysport, is a new racing organization.